The price of crude oil futures are settling the day at $64.05. That is up $0.65 or 1.03%. The high today reached $64.12. The low reached $62.99. The pair is settling right near the highs. 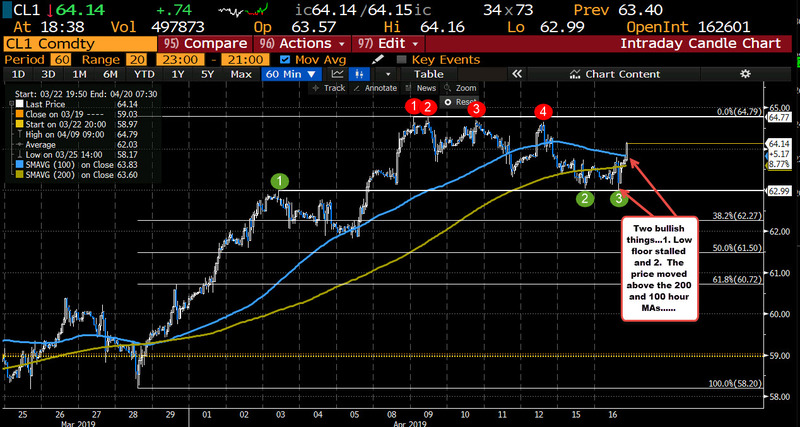 Technically, the move higher into the close has been helped by a bounce off the lows from yesterday (and high from April 3) and the breaking of the 200 and 100 hour MAs at $63.60 and $63.83. That also gives the technical picture a more bullish bias going forward.